Tony Baxter can be considered a product of WED’s first generation of Imagineers. Beginning his career at Disneyland as a front line cast member and working his way into Imagineering, Tony Baxter was lucky enough to be under the tutelage of Claude Coats, Marc Davis, and John Hench and absorbed their pioneering spirit into his own outlook and work for WED Enterprises. This philosophy of early WED’s character is easily seen in Baxter’s ideas for how to expand Disneyland and served as a standard of quality for how he exacted and executed his craft in all his projects. But, for the purpose of today’s article, I would like to delve into three projects. 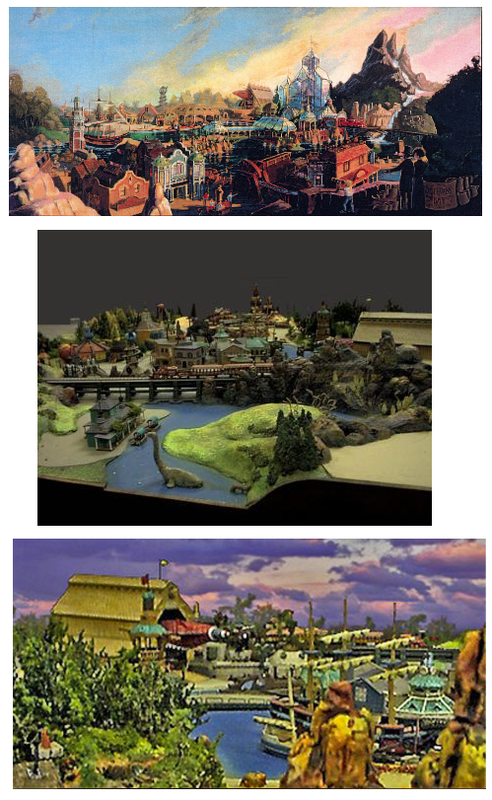 Two that never left the drawing board and one that has been build, cherished, and absorbed into the pantheon of Disney’s brand of experiences and attractions: Discovery Bay, Dumbo’s Circusland, and finally, Big Thunder Mountain Railroad. Discovery Bay was conceptualized to be an extension of Frontierland and to be evocative of San Francisco during the age of the gold rush. Rooted in the spirit and idea of manifest destiny and spurned on by the scientific progress made in the mid 19th century, Baxter’s version of San Francisco would have had a heavy dose of fantasy injected into it so as to feel connected to Disneyland’s other realms. As it always is with settings in a magic kingdom setting, realism gives way to idealism and fantasy lurking behind façades and just out of sight. As discussed here before, I am of the thought that Marc Davis, a senior colleague of Baxter’s, was a great proponent of this Imagineering method. Though intended to be the modus operandi of Discovery Bay, especially with its both physical and philosophical links to Frontierland, Baxter’s plans for the bay were interspersed with fantastical, yet scientifically believable, structures and environments. Realism was to be blended with fantasy to create the illusion of a working scientific vision of the 1800’s. In retrospect, the style of Discovery Bay might have been or might even be considered by our standards to be “steampunk”. Discovery Bay was, after all, to include references to 20,000 Leagues Under The Sea and Harper Goff’s brilliantly designed Nautilus. Guests would even be given the opportunity to dine in Captain Nemo’s Grand Salon on the submarine, beneath the waves and surrounded by the plush aesthetic of wrought iron, velvet, and rivets and iron works. In addition to this, the dirigible from “Island At The Top Of The World” would be given a home in Discovery Bay and serve as one of the other visual standpoints in the area. Further attractions in Discovery Bay would have been original and drawn from genres instead of films previously released by Disney. One with the deepest and richest conceptual past is Professor Marvel and his Gallery. Modeled after Rolly Crump’s Museum of the Weird, the eccentric and dragon breeding Professor Marvel would have hosted a revolving theater show (not unlike the Carousel of Progress) that showed off curios and antiquities and oddities from around the world over in a typical Victorian “fair and exhibition” setting. 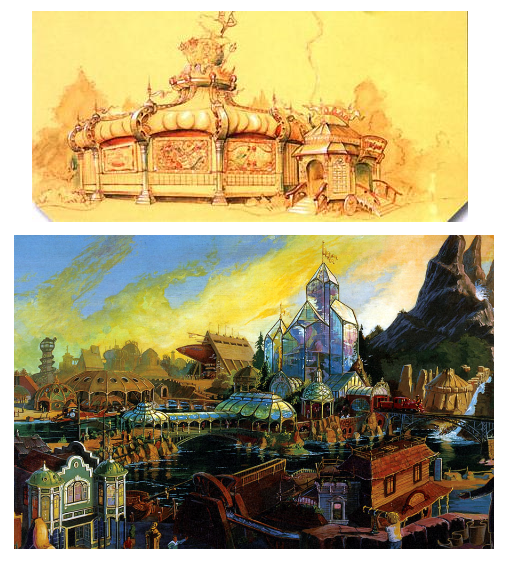 Concept art shows that the façade would have boasted an idealized seaside amusement park aesthetic…. But later concepts for the same show illustrate that the attraction was given a towering and crystalline shape. In a grand working of irony, these plans for Discovery Bay, while the most detailed out of any in the previous line of succeeding concepts and ideas for the expansion, were mothballed when Kodak signed on to sponsor EPCOT Center’s Journey into Imagination pavilion in 1977. So, not wanting to lose any of their characters or ideas, Baxter and Steve Kirk, another member of the WED team tasked with Discovery Bay, reused their rudimentary ideas for the Imagination pavilion. Professor Marvel became Dreamfinder, his roving show became a romp through the realms of abstract thought, and the score of dragons he bred coalesced around Figment, the impish and reptilian spirit of imagination. The architectural ideas for the land weren’t lost either. 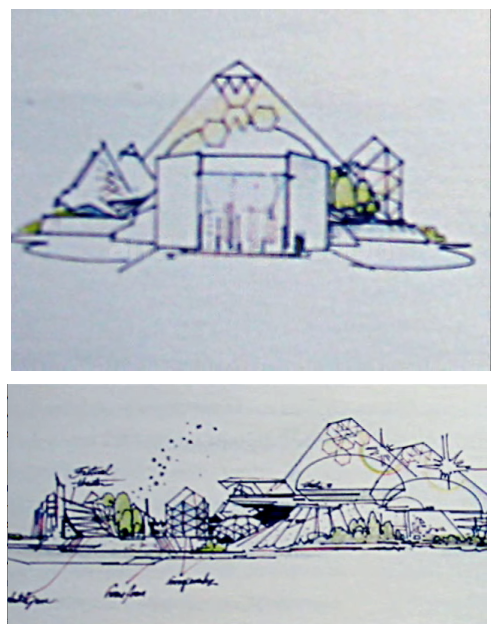 At this point in EPCOT Center’s development, a ecology pavilion was planned to be built of glass and steel, much in the same vein as Disocovery Bay’s crystalline tower. 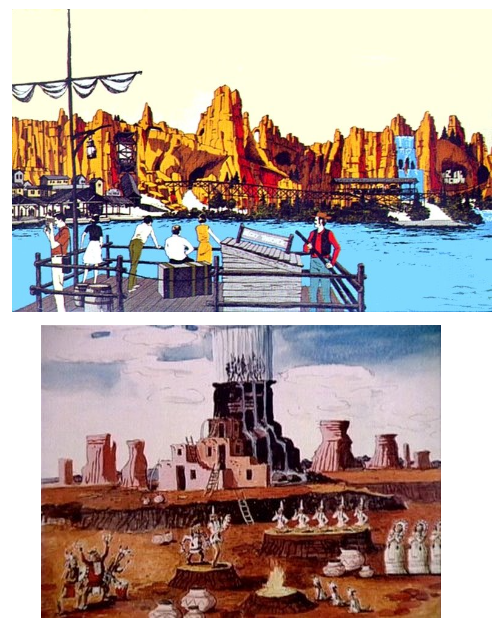 These ideas evolved into the design for both The Land and Journey into Imagination, along with the other idealist remnants of Discovery Bay. Though separated by space age aesthetics and EPCOT Center’s driving intent to illustrate and exhibit, the experience of Dreamfinder and Figment can be tied to the conceptual history of Disneyland’s attempt to expand Frontierland with the whimsy of fantastical place making. 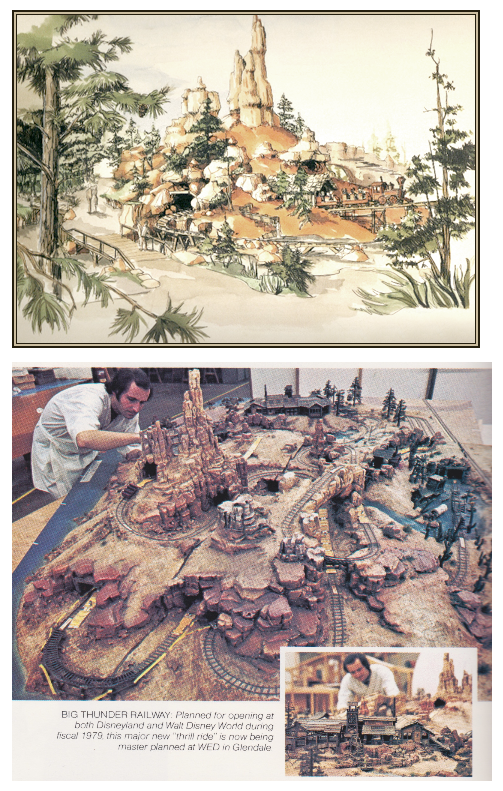 Discovery Bay’s ancillary attractions would have contributed to the breadth of this land mixed with both fantasy and steampunk “realism”. A shooting gallery themed to a pyrotechnic market would have aptly been named “The Fireworks Factory”. A traditional Chinatown, as found in San Francisco, would have been situated along the Rivers of America. And a roller coaster, “The Spark Gap Electric Loop”, would have rounded out the land’s thematic attractions. A lighthouse would have been located at the entrance to Discovery Bay, heralding the spirit of discovery to grace the land and to mark serve as a visual “weenie” to draw guests into the northeastern half of Disneyland. Although extravagant enough to warrant a lone position in Disneyland’s plans to expand in the 1970s, Discovery Island was paired with Dumbo’s Circusland to help flesh out the original Magic Kingdom on the eve of her 25th anniversary. Another thematic venture lead by the creative efforts of Tony Baxter, this land would serve as a bridge from Fantasyland and to the northwest portion of the Rivers of America…. Right where Discovery Bay was to turn up. 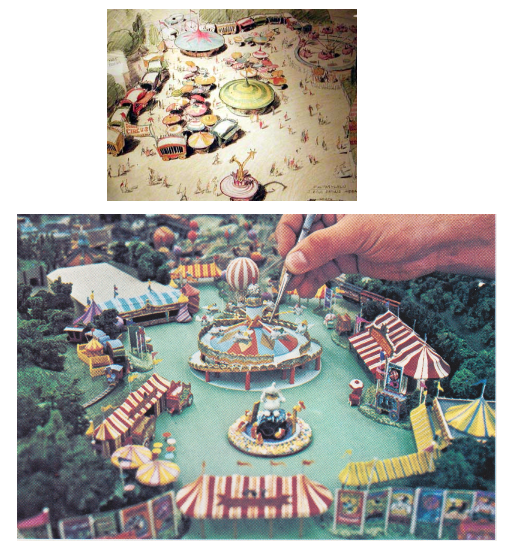 An extension, but almost “subland” of Fantasyland, Circusland would have a recreation of a turn of the century circus, based on Dumbo’s adventures in the film of the same name. Moving the Dumbo spinner out of its home in Fantasyland to be the focal point of this new land, Circusland would have recreated the excitement and attractions of the circus come to town. The Dumbo spinner itself would have been set on an elevated platform and given prominence, while a Pinocchio dark ride and Stromboli puppet show graced the plot behind the iconic spinning sky ride. Out of all these plans, the Pinocchio ride would be the only thematic entity come to pass, and would be built in Disneyland’s New Fantasyland in 1983. This part of the Circusland complex would have also been serviced by the “clown restaurant”, serving up carnival faire and offering a energetic and banner strewn experience. 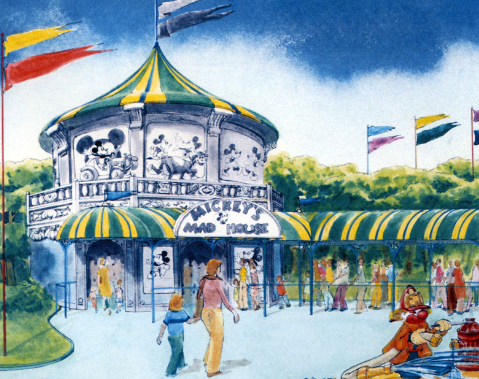 Adjacent to this portion of Circusland, Mickey’s Madhouse, another dark ride, would have dominated the attraction roster. Themed to the heady days of the Disney Bros. Studio in the 1930s, this ride would have been madcap in nature and featured the 1930’s black-and-white aesthetic of Mickey Mouse shorts and been underscored by raucous ragtime melodies. 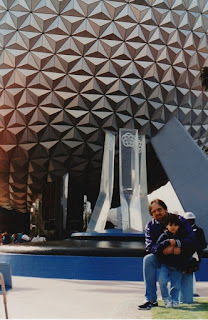 The entirety of Circusland would have been anchored by “Circus Disney” a massive E Ticket ride through of a myriad of Disney characters, music, and stories, all brought to exacting and detail driven life through advanced Audio Animatronics. Not dissimilar to the Mickey Mouse Revue in Florida’s Magic Kingdom, this musical journey would have only been enhanced by augmenting the show to progress along a track and have thrilling encounters with the characters. 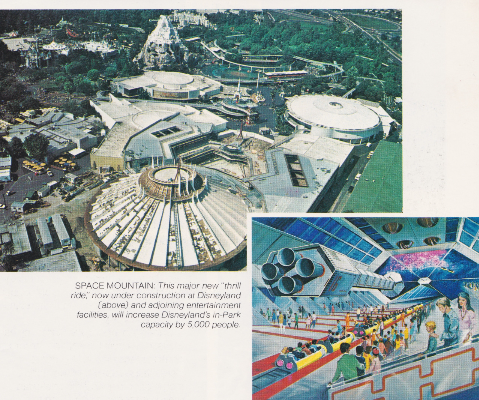 Press material released in the 1970s seems to indicate that the ride would have featured a new system of motion for guests. While details of this are murky, specifics about the ride are not. Guests would have been whisked through the wild animal menagerie, with the cast of the Jungle Book and then flown down the circus midway with Dumbo himself. Here, in the big top, we would have found ourselves part of the three-ring show and subject to the madcap acts and daredevil antics of The Flying Goofys. 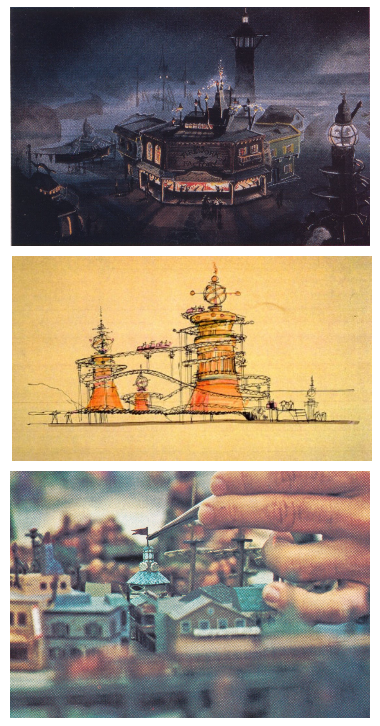 As mentioned before, the Circusland concept was never built in Disneyland, save for the lone Pinocchio ride in 1983. However, Walt Disney World opened Storybook Circus in 2013, using much of the same thematic drive to guide the aesthetic choices made in the land. 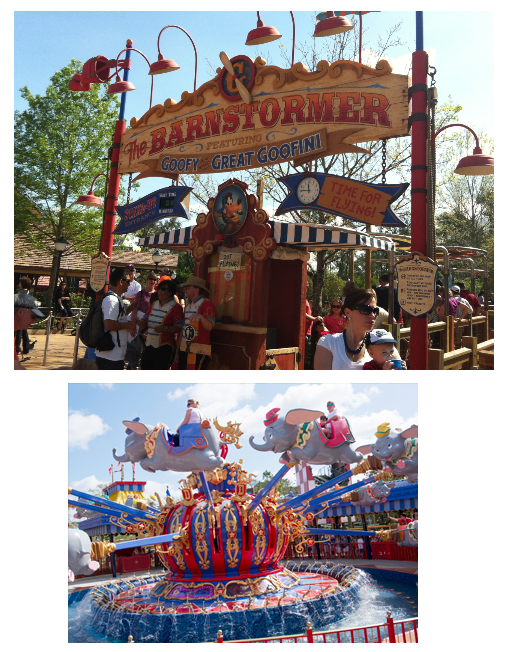 While not featuring any of the zany thematic dark rides planned for Circusland, Storybook Circus does give prominence to Dumbo, and doubles the spinning, iconic ride, while providing for the environment of the carnival in a thematic waiting area. Located where the Magic Kingdom’s Toontown used to reside, Storybook Circus repurposed “The Barnstormer”, a small kiddie coaster themed to Goofy’s farm, to a rollicking stunt show with “The Great Goofini”. While not totally echoing the spirit of Circus Disney, at least the thematic and genre sensibilities are echoed. 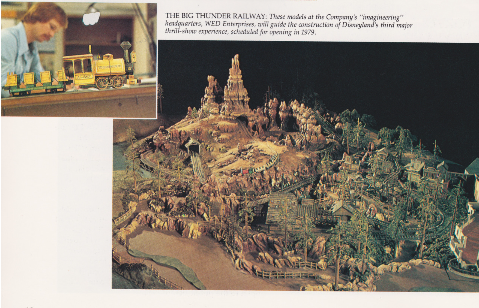 And finally, that brings us to the wild west and the only Baxter lead expansion initiative that was conceptualized and built during the bicentennial decade: Big Thunder Mountain Railroad. Born of Walt Disney World’s need to flesh out her thematic attractions during her heady first decade, and spurned on by the totally separate efforts of Marc Davis, Big Thunder’s creative history is a convoluted myriad of situations and executive decisions. Originally planned to be built in Florida, first, Tony Baxter’s wild mountain thrill ride was thematically tied to an attraction that Marc Davis dreamed up: Thunder Mesa and the Western River Expedition. Davis’ plan was to construct a massive rock plateau and weave attractions through the scenery. Primarily, two rides were developed for this concept: a slow Audio Animatronic heavy show attraction and a thrilling mine train idea. Davis, one of the key Imagineers behind Pirates of the Caribbean and the “characters as scenery” driven second act of the Haunted Mansion, planned to bring his brand of memorable characters and sight gags west, to Frontierland. The Western River Expedition was planned to be a meandering river voyage through the American southwest and would have played upon the western genre with a cast of Audio Animatronic cowboys, Native Americans, animals, and even cacti. But this wasn’t to come to pass. Disney World, intent on diversifying her thematic experiences quickly green lit a Space Mountain to attract thrill seekers, and also approved of a plan to bring over a version of Davis’ Pirates of the Caribbean to waylay guest complaints surrounding the fact that The Magic Kingdom lacked the highly popular and publicized Pirates ride upon opening. With funds diverted to the Space Mountain project in Florida (and soon to be so, too, in California) and an altered facsimile of Pirates of the Caribbean, Davis’ plan for his western river attraction faltered. 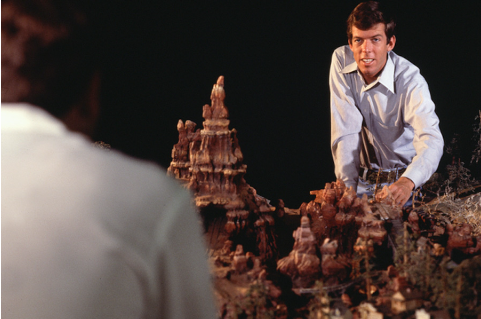 However, the plans for Thunder Mesa and a runway mine train stayed in the mind of his fellow Imagineer, Tony Baxter. While given the go ahead to develop the mine train ride for Florida, California was desperate to expand and bolster their own attraction roster. Compounding this, Frontierland’s Mine Train Through Nature’s Wonderland was aging and forcing a extremely high cost of maintenance. To help bring this cost down and in an attempt to keep Disneyland fresh and new, management had no trouble in persuading Tony Baxter to design Big Thunder Mountain Railroad for both coasts. Disneyland opened her version in 1979 with rockwork based off of Brice Canyon in Colorado, while Walt Disney World debuted a taller and wider rock formation in 1980. Both mountains share the same track, though aesthetic differences populate each version. For example, Tony Baxter ensured that Disneyland’s Mine Train Through Nature’s Wonderland would have a lasting tribute in Big Thunder with the preservation of Rainbow Ridge, the original mining town from the 1956 attraction. Big Thunder Mountain Railroad has since gone on to have been added to Tokyo Disneyland and Disneyland Paris where the Thunder Mesa concept was reevaluated to fit the whole of Frontierland and give the area a unifying backstory and aesthetic. By dint of the creative organization that they are, Imagineering will always produce more concepts than physical products and more physical products that combine and interact and are influenced by all of the concepts that have come before them. Although an article like this can read as a winsome and wishful litany of “things we wished happened”, the importance and relevance of conceptual history lies in the details and trajectory of the ideas discussed here. Though not fully built to potential, each of Disneyland’s attempts to expand in the 1970s were all harbingers of other iconic and beloved attractions. 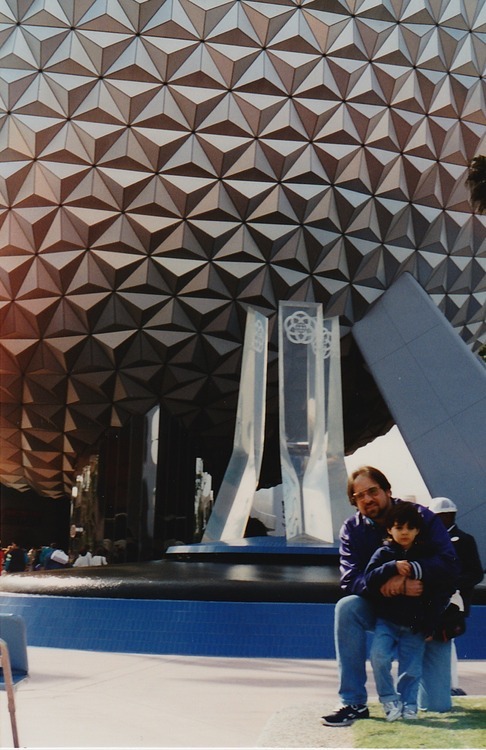 Tony Baxter’s influence on these thematic entities is also vital as his tenure as an Imagineer was just beginning and would prove crucial to his own development and Imagineering’s way forward in perfecting the art of the theme park and thematic experience. Therefore, it can be seen that this decade was a watershed moment for all of Disney as their best ideas, both built and unbuilt, would continue to influence Disney’s products and artful creations for years to come.